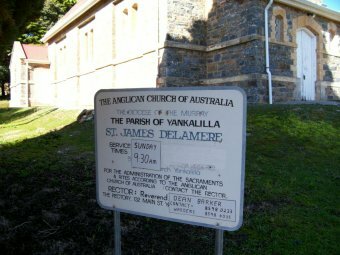 On 7 th April 1870 , the then incumbent for the Yankalilla parish, Rev (later Arch-deacon) C W Morse held a meeting. It was resolved that steps be taken towards building a church at Glenburn and a building committee was formed. A half acre piece of land, part of Section 1522 was given for the church site by James Cole. The building, which became St. James Church, was designed by W F Anderson and co. and built mainly by voluntary labour using local carpenters and stonemasons, and it was said to be one of the prettiest in the colony. The foundation stone was laid on 19 th September 1870 by the Rev. Dean Russell. 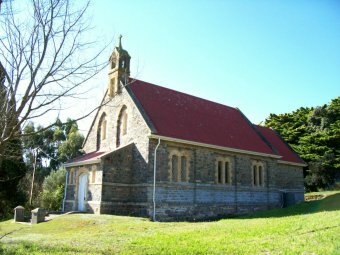 Although the church was not quite complete, the dedication was performed by Bishop Augustus Short on Thursday 4 th May 1871 in the presence of about five hundred people, including the State governor Sir James Fergusson. St James Church became a very popular place of worship for the Church of England residents of Second Valley , Delamere and the neighbouring districts. In 1877, following a visit to England , Archdeacon Charles Morse reported that St Peters Church in Britford in the diocese of Salisbury had given a font to the St James Church. It had been in use in Britford for two hundred years but its origin is believed to date as far back as the Saxon era which would make it over nine hundred years old. The font is considered to be unmatched in Australia and a priceless possession of which the parishioners are very proud.